Spoil your guests with the truly authentic experience of a belly dance performance accompanied by live Middle Eastern drumming! About Our Middle Eastern Percussionist..
George El-Azar is an Australian percussionist in Melbourne. Born and raised in Beirut, Lebanon, he developed an interest in music and percussion from a very young age. He plays the Darbuka (also referred to as the Derbakki drum) and other percussion instruments such as the cajon, dohola, bendir, riq, and various other frame drums. His style is influenced by fusing traditional Arabic techniques along with the modern Turkish styles of drumming to create his own unique sound. George has also learnt from several masters of percussion whilst traveling through Europe and the Middle East. A few notable teachers include Hakan Kaya (Turkey), Izzet Kizil (Turkey), and Rony Barrak (Lebanon) and Faisal Zedan (Syria/US). George has accompanied all types of bands from rock, electronic, Latin, Turkish, and Middle Eastern. 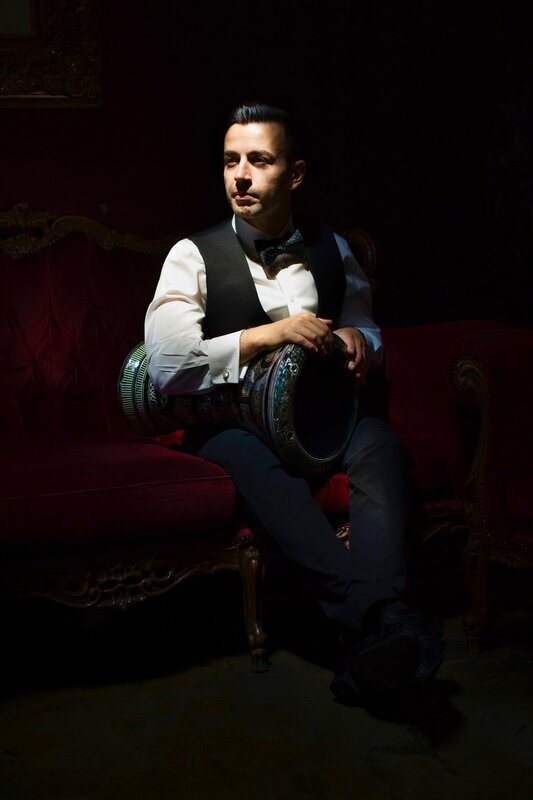 He is currently the lead percussionist in Melbourne's popular Middle Eastern band, Zourouna. George also performs solo with belly dancer Ekaterini and together have performed countless shows over the past years working together.